A young girl believes her father is the king of fixing things. He even knows how to make her ailing mother feel better. However, after her mother passes away, she discovers that superglue and sticky tape can’t fix broken hearts. Together she and her father find a way to glue back the pieces of their lives. This picture book is a poignant look at the way a young girl copes with the loss of her mother. Replacing and repairing damaged emotions is not always as straightforward as gluing a broken kite back together or sewing up a torn toy. By sticking together with her dad, she is able to strengthen her resilience and ability to cope with one of life’s harsher lessons – loss. It also addresses the very real situation grieving parents may find themselves in at times of loss (of a partner or loved one); no longer able to adequately console or comfort their dependants, so that the child in turn attempts to ‘fix’ an adult’s grief, ultimately augmenting their own feelings of helplessness when this is not always possible. The idea spawned from an incident created by my then infant child. A bowl was broken, shattered to splinters, and like many young children who view their parents as omnipresent cure-alls, she immediately presumed Daddy would fix it. It got me thinking, what if a Daddy couldn’t fix something. What if one day, he needed fixing, too? How would a child cope in that situation? Nicky’s beautiful watercolour illustrations breathe heart and soul into this story. They are exactly the way I envisaged this family and fill me with raw emotion every time I look them. 2018 NSW Premier’s Reading Challenge K-9 Booklist Level K-2 See full list, here. Radio Interviews: Click on the images below to listen to me waxing lyrical about The Fix-It Man on airways across Australia. For information on events involving The Fix-It Man, head over to Dim’s Write Stuff Blog or EK Books’ Events page. 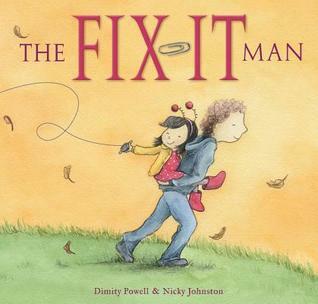 Beautifully written and illustrated, The Fix-It Man is a valuable tool for educators, parents, schools and all parents. It shows metaphorically and symbolically that through persevering and getting on with ordinary life tasks, even through the harsh reality of loss, a deeper level of love and understanding can emerge. This is a wonderful book also to benefit men as role models for grieving children, as it shows that both task AND relationship are powerful healers in the grieving process. There’s such symmetry between Dimity’s text and Nicky’s evocative illustrations which take the story to a whole new level.They truly capture the emotion and poignancy of the subject matter and the beautiful relationship between father and daughter.I can see The Fix It Man providing a wonderful conversation book in homes and schools, not just for gently introducing children to the concept of loss, but for building empathy for others.Dee White, Deescribe Writing.